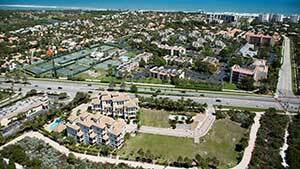 Tierra Del Sol, located on the Intracoastal Waterway, is a luxury community comprised of 12 exclusive townhomes. Floor plans are available in the Crosswinds model: 3 bedroom 3.5 bathrooms with an entertainment room or 4 bedrooms and 4.5 bathrooms, each spanning 3444 square feet. There are four upper level balconies available to catch stunning views, as well as a lower level lanai and elevator for convenience. Other common features include a spacious master suite, gourmet kitchen, luxurious baths, private entry foyer, and more. Tierra Del Sol is conveniently located within close proximity to shopping, golf, dining options, and entertainment. To learn more about Tierra Del Sol, please email or call (561) 746-7272 and one of our team will be happy to answer your queries.